Earlier today (as part of a giveaway) I asked you to share some tips on how you add fruit and vegetables to your meals. So far there have been some great responses, from adding fruit to your smoothies and to salads, to adding veggies to your pasta dishes and soups! Now it’s my turn to share! One canned vegetable that I *always* keep full stocked in my pantry is canned tomatoes. From simple diced tomatoes to diced tomatoes with green chilies, to fire roasted tomatoes; this humble canned vegetable takes up valuable pantry space in all sorts of forms. Canned tomatoes are a priceless comity in my kitchen because I use them in all sorts of dishes. From making marinara sauce to salsa, to adding canned tomatoes to enchiladas and queso, to being a vital ingredient in pasta dishes, soups, stews and chili; this canned veggie plays a vital role! Knowing I have an affordable substitute for fresh tomatoes in the dead of winter and knowing that I can always whip up one of the above dishes using this and other pantry staples whenever 5 o’clock rolls around, takes some major stress off dinner time! Today I am sharing one of our favorite meals (one I have been making regularly for years!). 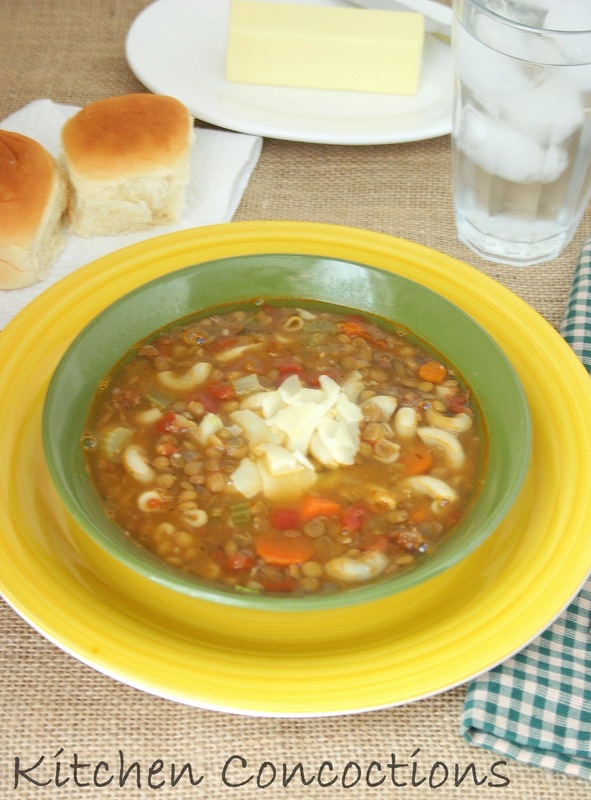 I have actually shared this soup before, in the early days of this blog, but thought it was so good not to share again (and it could defiantly use an updated photo). 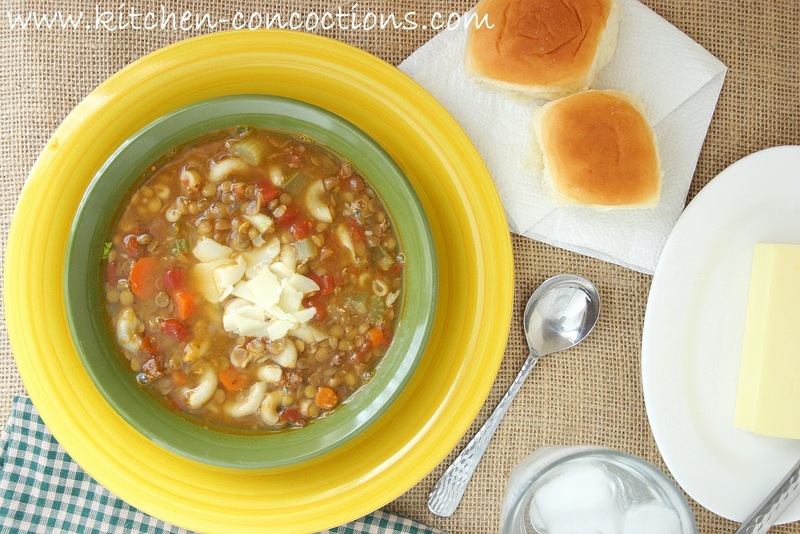 I love this soup, because while it does require about 45 minutes cook time, the hands on time is only about 15 minutes. It also uses simple pantry and refrigerator staples (including canned tomatoes!) to create a hearty and soul soothing meal, capable of feeding an army on mere pennies. Normally I make this a vegetarian soup, due to the fact the veggies, lentils and pasta are more than plentiful; but every now and then I through in some cooked ground beef or sausage. Oh and one more word to the wise. This makes a ton of soup. Like feed your family for a week, make a freezer meal, or take some to the neighbors, TON! Add the onion, carrots and celery, and sauté for about 3-4 minutes. Add in the garlic and sauté 1 to 2 minutes more. Stir the tomatoes with their juices. Add in lentils and stir to coat. Stir in 10 cups of broth and seasonings. Bring to a boil over high heat. Cover and reduce heat to a simmer. 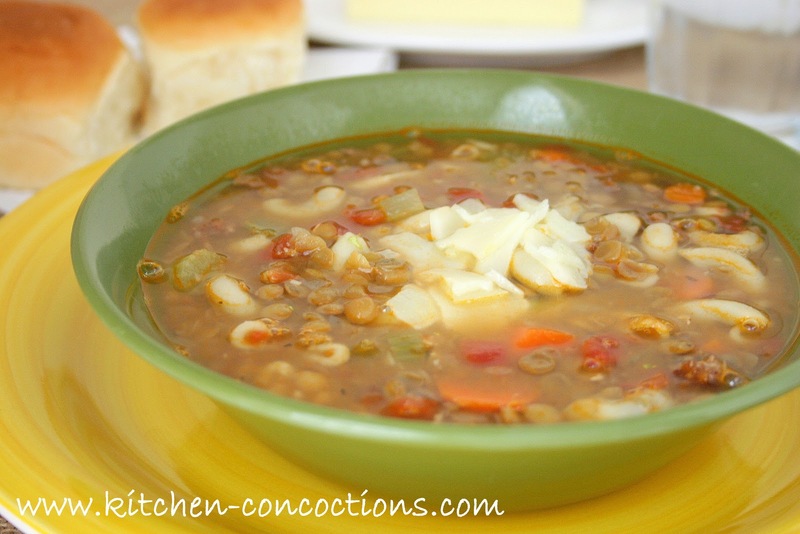 Simmer over low heat until the lentils are almost tender, about 35-40 minutes. Add additional broth as needed. Stir in the pasta. Simmer until the pasta is tender but still firm to the bite, about 8-10 minutes. Season with additional salt and pepper, if needed. Ladle the soup into bowls. Sprinkle with the cheese, if desired. Note: ½ – 1 pound cooked and crumbled ground beef or Italian sausage can be added half way through cooking time if desired. Ooh, yes, please! I love making a big batch of soup and freezing some. This looks delicious. I totally agree with you on canned tomatoes. I try to can as many of my own as I can, but there are some awfully good store-bought versions, too. I'm digging Muir Glen fire-roasted tomatoes lately.